Pete Seeger had a thing or two to say about private property, which is why his thoughts were included in the US land reform magazine (yes, there used to be such a thing) People & Land . You’ll find the page below in Volume 1 Number 2 – Winter 1974. This Martin Luther King day, why not celebrate by reading one of MLK’s last speeches, the one delivered at Carnegie Hall on 23 February 1968 to fête the 100th Anniversary of the birth of W. E. B. DuBois? Not, at least, if you go to the MLK archive (sponsors: JPMorgan Chase & Co.). I wrote to them earlier this week, pointing out that in their million document collection of speeches, letters and pamphlets, they had omitted Dr King’s encomium to the great W. E. B. DuBois. Carnegie Hall recorded the event, and posts a picture (above) celebrating the then-Nobel Laureate’s oratory. The archives have yet to reply. We cannot talk of Dr. Du Bois without recognizing that he was a radical all of his life. Some people would like to ignore the fact that he was a Communist in his later years. It is worth noting that Abraham Lincoln warmly welcomed the support of Karl Marx during the Civil War and corresponded with him freely. In contemporary life the English- speaking world has no difficulty with the fact that Sean O’Casey was a literary giant of the twentieth century and a Communist or that Pablo Neruda is generally considered the greatest living poet though he also served in the Chilean Senate as a Communist. It is time to cease muting the fact that Dr. Du Bois was a genius and chose to be a Communist. Our irrational, obsessive anti-communism has led us into too many quagmires to be retained as if it were a mode of scientific thinking. 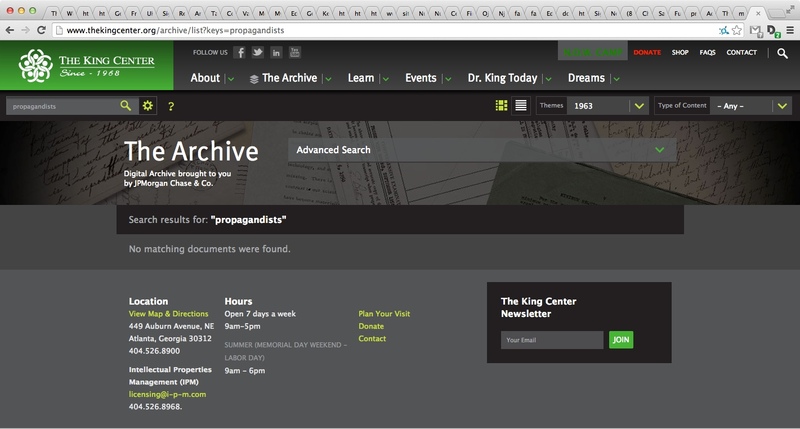 This, incidentally, is what you get when you search for ‘propagandists’ on the MLK Archives (sponsors: JP Morgan Chase & Co.). Search for “justice will roll down like waters from a mighty stream” and this is what you get from the MLK archives (sponsors: JPMorgan Chase & Co.). On the anniversary of Martin Luther King’s death, pointing out that he was increasingly interested in the causes of poverty is the right thing to do. His memory is ill served by an archive (sponsors: JP Morgan Chase & Co.) that mutes him. I was very pleased to write this piece for The Financial Times and very pressed to condense the idea of ‘food sovereignty’ down to 600 words. If you’d like to know more, here’s a slightly lengthier treatment. Bob St Peter, a man about whom you’ll be hearing a great deal over the next few years, co-wrote this piece with me for the good people at Civil Eats. Thanks to them, and everyone who donated to support their Kickstarter project. In the past, I’ve linked to pieces that challenge the ethically untroubled, and systemically timid work of Abhijit Banerjee and Esther Duflo, of Poor Economics fame. 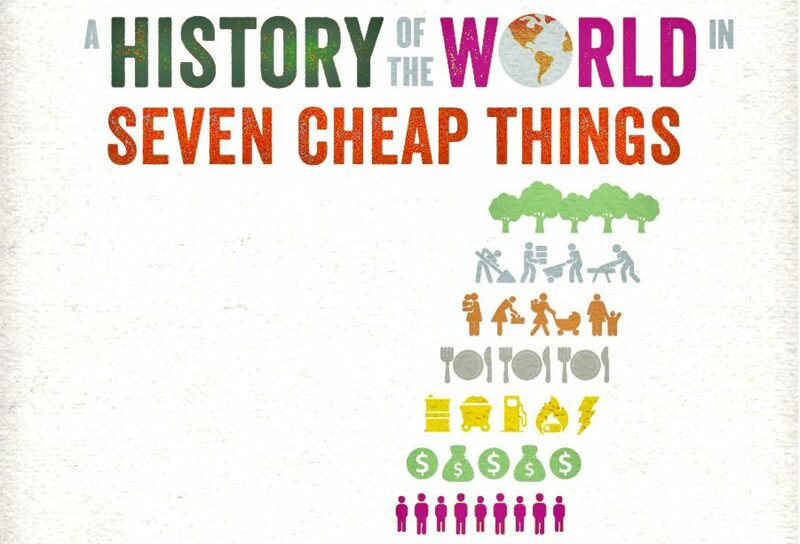 If you’re unfamiliar with their work, the quick summary is this: they start with the idea that poor people aren’t as dumb as development theories have tended to make them out. This is laudable, though not particularly original. Poor people have, for quite some time, been telling people that they are professors of their own poverty. Banerjee and Duflo suggest that perhaps the ideas that poor people come up with to survive poverty are better than the policies crafted for them in Washington. So far, so good. The trouble is that when it comes to fixing poverty, the theories of poor people don’t seem to matter much. What is most important is What Works. Banerjee and Duflo’s rigorously clinical approach – they use randomized controlled trials to test What Works – transcends ideology to reveal that bed nets and deworming are good ideas. Again, nothing terribly objectionable here. Except that this approach limits the extent to which poor people are allowed to be clever. The extent of their intelligence is reduced to rats in a maze, figuring out what works under the benign and compassionate supervision of ‘practical visionaries‘at MIT. If there are ways that poor people want to change their relation to power, we’ll never know. These are not subject to randomized controlled trials. Let’s call this fixation with What Works “Millennial Economics”. To be obsessed with What Works is always to exclude consideration of how the context of what works might be different. What works when you’re being beaten is to move away from the dude with the baton. It’s a rational solution that many poor people have arrived at using their own faculties of reason. But surely the police shouldn’t have been beating you in the first place. Protesting against the police, demanding that the police be held accountable, this too can work. But it requires politics, not technocracy. It means ideology, not expertise. For a generation – for a society – that looks to Washington and sees politics hopelessly divided, who wouldn’t want to stick with What Works? Except, of course, that Washington isn’t terribly interested in much beyond a tiny spectrum of difference between plutocrats whose bickering has brought the very idea of politics into disrepute. It’s a context in which Banerjee and Duflo’s reasonableness is refreshing. Even if their own politics crushes those of poor people. And even if what you’re left with is a few splats of policy ideas, because the theory that might have connected and made sense of them has been erased, because methodologically suspect and politically polluted.